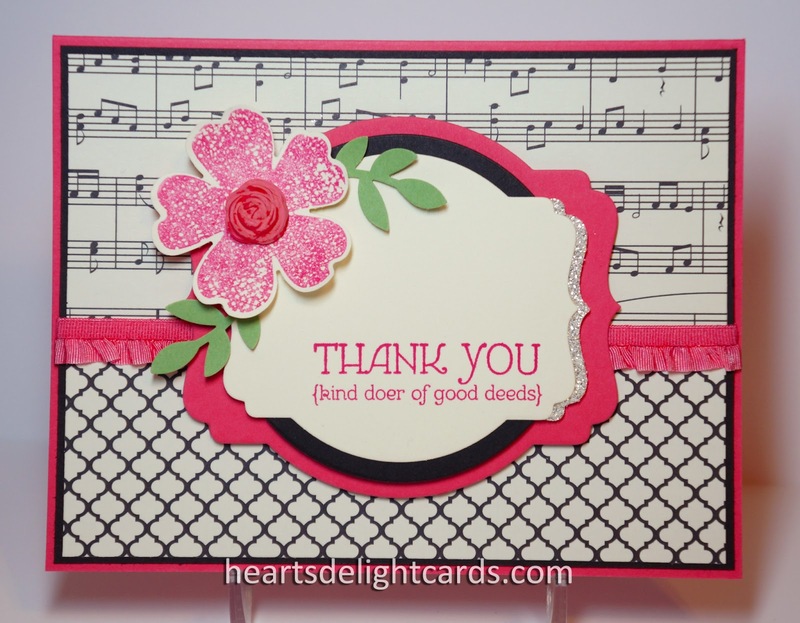 Heart's Delight Cards: NEW Catalog Freaks Tour! 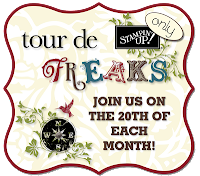 Welcome to the Tour de Freaks blog tour for June. This time I get to start the tour! If you hopped in from somewhere else, you may have just landed here from Patty Bennett's blog. You can follow the links at the bottom of each blog to complete the circle and end up here, again. There are only nine stops this month, so it will go quickly! This month's theme is anything from the NEW catalog. Boy howdy, did I ever have a hard time narrowing that down to just a few items! There is MUCH to love (and covet) in the new catalog! 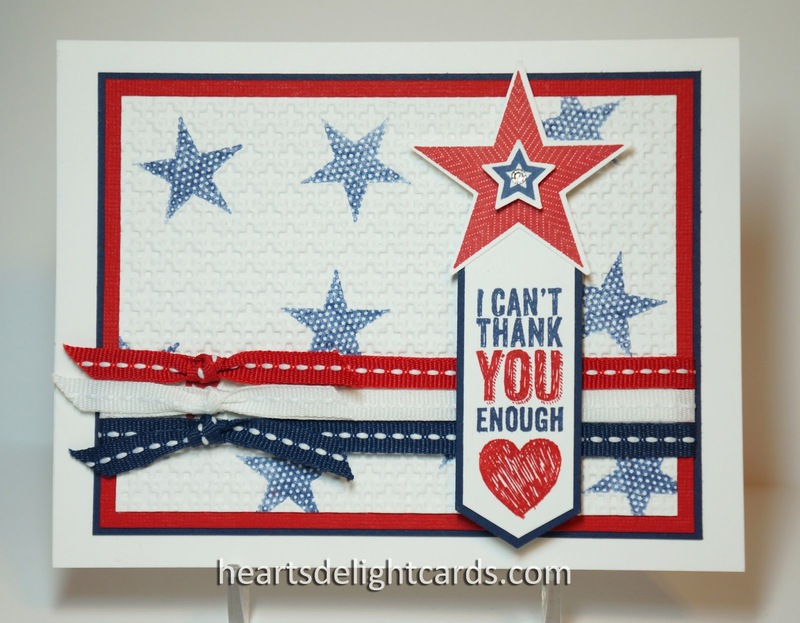 My first card uses the Simply Stars and Chalk Talk stamp sets. When I saw the stars, I immediately thought "patriotic" and "hero", and what better way to celebrate the upcoming Independence Day holiday than by thanking the men and women who are serving our country, keeping us free? This card will be sent to Operation Write Home to thank a military member for their service. Didja notice I borrowed Patty's fab idea for using the Hexagon Punch on the end of the pennant?! My next card features my favorite new Designer Series Paper, Gingham Garden. I've loved gingham fabric since I was a little girl, so this paper was at the top of my "must have" list. Kind & Cozy has a stamp the reminds me of fancy canning jar lids, and the many jars of jam, green beans and tomatoes I've put up over the years! The new Circle Framelits were used here, and the Mosaic Punch made the fancy ends on the greeting. Candy Dots accent the banner - sweet! My last card is actually going to be one of my convention swaps, so if you're a Stampin' Addict and signed up for the "Over the Top" swap, stop right here! 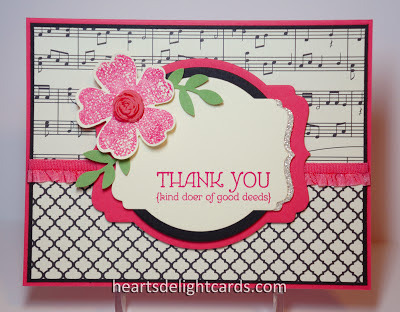 This card features the new Deco Label Framelits, and the awesome Flower Shop stamp set with the matching Pansy Punch. The DSP used is my second fave in the catty, Modern Medley. Notice how the Circle Framelits fit perfectly behind the greeting? The possibilities for layering these two Framelits sets are nearly endless! Another item from the new catalog is the fun Simply Pressed Clay and Buttons & Blossoms mold. I made a bunch of the smallest flower, let them dry overnight and then colored them with a Stampin' Write Marker. 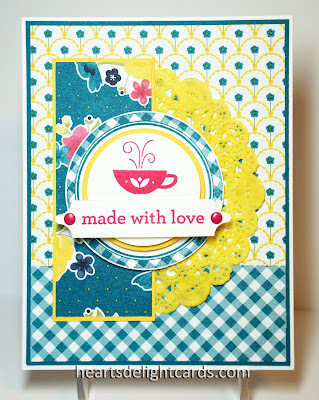 Easy way to get an embellishment to match any color scheme! Well, that's all for me. Your next stop is the ever-amazing JanTink at Stamps, Paper, Scissors. I can't wait to see what her jeenyus has dreamed up! Cute projects, Cindy! I see you and I were thinking alike with the Simply Stars set! Just lovely projects Cindy! Love all of them but the stars card is superb! Nice cards. Love the colors on the second card. Loving the gingham garden paper. The red white and blue is my fav! Very festive! Love the stars! So fun! FAntastic projects!! They are all gorgeous!! What remarkable cards. Thank you for the inspiration!